For other uses, see Aristaeus (disambiguation). A minor god in Greek mythology, attested mainly by Athenian writers, Aristaeus (/ærɪˈstiːəs/; Greek: Ἀρισταῖος Aristaios), was the culture hero credited with the discovery of many useful arts, including bee-keeping; he was the son of the huntress Cyrene and Apollo. Aristeus ("the best") was a cult title in many places: Boeotia, Arcadia, Ceos, Sicily, Sardinia, Thessaly, and Macedonia; consequently a set of "travels" was imposed, connecting his epiphanies in order to account for these widespread manifestations. If Aristaeus was a minor figure at Athens, he was more prominent in Boeotia, where he was "the pastoral Apollo", and was linked to the founding myth of Thebes by marriage with Autonoë, daughter of Cadmus, the founder. Aristaeus may appear as a winged youth in painted Boeotian pottery, similar to representations of the Boreads, spirits of the North Wind. 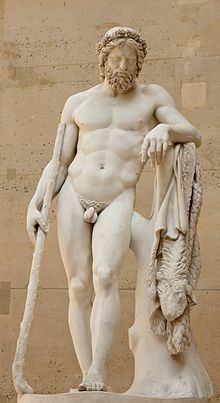 Besides Actaeon and Macris, he also was said to have fathered Charmus and Callicarpus in Sardinia. According to Pindar's ninth Pythian Ode and Apollonius' Argonautica (II.522ff), Cyrene despised spinning and other womanly arts and instead spent her days hunting, but, in a prophecy he put in the mouth of the wise centaur Chiron, Apollo would spirit her to Libya and make her the foundress of a great city, Cyrene, in a fertile coastal plain. When Aristaeus was born, according to what Pindar sang, Hermes took him to be raised on nectar and ambrosia and to be made immortal by Gaia. Aristaeus is a god of an array of rustic, rural arts and practices; from his father, Apollo, Aristaeus learned the arts of healing and herblore; from his aunt, Artemis, Aristaeus learned how to hunt animals, and how to prepare the meat and skins; from his uncle, Dionysus, Aristaeus learned the processes of how to produce alcoholic beverages, such as wine, beer, mead and kumis, etc. ; and from his great-aunt, Demeter, Aristaeus learned the skills of agriculture and of herding animals. The Myrtle-nymphs taught him other useful arts and mysteries, such as how to prepare milk for cream, butter and cheese, how to tame the Goddess's bees and keep them in hives, and how to tame the wild oleaster in order to make it bear olives and process them into olive oil. Thus he became the patron god of cattle, fruit trees, hunting, husbandry, and bee-keeping. He also taught to humans the dairy skills (including cheesemaking), as well as the use of nets and traps in hunting. When he was grown, he sailed from Libya to Boeotia, where he was inducted into further mysteries in the cave of Chiron the centaur. In Boeotia, he was married to Autonoë and became the father of the ill-fated Actaeon, who inherited the family passion for hunting, to his ruin, and of Macris, who nursed the child Dionysus. According to Pherecydes, Aristaeus fathered Hecate, goddess of witchcraft, crossroads, and the night. Hesiod's Theogony suggests her parents were Perses and Asteria. Aristaeus' presence in Ceos, attested in the fourth and third centuries BC, was attributed to a Delphic prophecy that counselled Aristaeus to sail to Ceos, where he would be greatly honored. He found the islanders suffering from sickness under the stifling and baneful effects of the Dog-Star Sirius at its first appearance before the sun's rising, in early July. In the foundation legend of a specifically Cean weather-magic ritual, Aristaeus was credited with the double sacrifice that countered the deadly effects of the Dog-Star, a sacrifice at dawn to Zeus Ikmaios, "Rain-making Zeus" at a mountaintop altar, following a pre-dawn chthonic sacrifice to Sirius, the Dog-Star, at its first annual appearance, which brought the annual relief of the cooling Etesian winds. In a development that offered more immediate causality for the myth, Aristaeus discerned that the Ceans' troubles arose from murderers hiding in their midst, the killers of Icarius in fact. When the miscreants were found out and executed, and a shrine erected to Zeus Ikmaios, the great god was propitiated and decreed that henceforth, the Etesian wind should blow and cool all the Aegean for forty days from the baleful rising of Sirius, but the Ceans continued to propitiate the Dog-Star, just before its rising, just to be sure. Aristaeus appears on Cean coins. Then Aristaeus, on his civilizing mission, visited Arcadia, where the winged male figure who appears on ivory tablets in the sanctuary of Ortheia as the consort of the goddess, has been identified as Aristaeus by L. Marangou. Soon Aristaeus' bees sickened and began to die. He went to the fountain Arethusa and was advised to establish altars, sacrifice cattle, and leave their carcasses. From the carcasses, new swarms of bees rose (see Bugonia). A variation of this tale was told in the 2002 novel by Sue Monk Kidd, The Secret Life of Bees. ^ His inventions of apicultural apparatus, such as the linen gauze bee-keeper's mask and the technique of smoking the hive, were elaborated by Nonnus in his Dionysiaca, V.214ff. ^ Compare the "travels" of Hercules in the Western Mediterranean. ^ An expression credited to Hesiod in Servius' commentary on Virgil's Georgics, I.14; cf. William J. Slater, Lexicon to Pindar (Berlin: de Gruyter) 1969, s.v. ""Nomios". When "pastoral Apollo" appears in lines of Theocritus (Idyll XXV) and Callimachus (Ode to Apollo, 47) the expression blurs the effective domaines of the two figures. ^ As on a Boeotian tripod-kothon at the Metropolitan Museum of Art, illustrated and discussed in Brian F. Cook, "Aristaios" The Metropolitan Museum of Art Bulletin New Series, 21.1 (Summer 1962), pp. 31-36; there Aristaeus hastens with a mattock and a one-handled amphora, which Cook interprets as filled with seed-corn. ^ Thus Pindar set into a mythological past a prophecy of the comparatively recent founding of Cyrene (630 BCE). ^ Agreus ("hunter") and Nomios ("shepherd") are sometimes given distinct identities among the Panes, sons of Pan. ^ Theophrastus, Of the winds 14, and other testimony noted in Walter Burkert, Homo Necans (1972), translated by Peter Bing ((University of California Press) 1983), p. 109 note 1; Burkert notes that Aristaeus is already mentioned in a Hesiodic fragment. ^ Apollonius of Rhodes, Argonautica 2.521ff. ^ Burkert 1983:109ff; Burkert notes an analogy to the polarity of sacrifices to Pelops and Zeus at Olympia. ^ Charikleia Papageorgiadou-Banis, The Coinage of Kea (Paris) 1997. ^ Marangou, Aristaios" AM 8772), pp77-83, noted by Jane Burr Carter, "The Masks of Ortheia" American Journal of Archaeology 91.3 (July 1987:355-383) p. 382f. ^ Eugene Vanderpool, "Two Inscriptions Near Athens", Hesperia 14.2, The American Excavations in the Athenian Agora: Twenty-Sixth Report (April 1945), pp. 147-149; Susan I. Rotroff, "An Athenian Archon List of the Late Second Century after Christ" Hesperia 44.4 (October 1975), pp. 402-408; Sterling Dow, "Archons of the Period after Sulla", Hesperia Supplements 8 Commemorative Studies in Honor of Theodore Leslie Shear (1949), pp. 116-125, 451, etc.